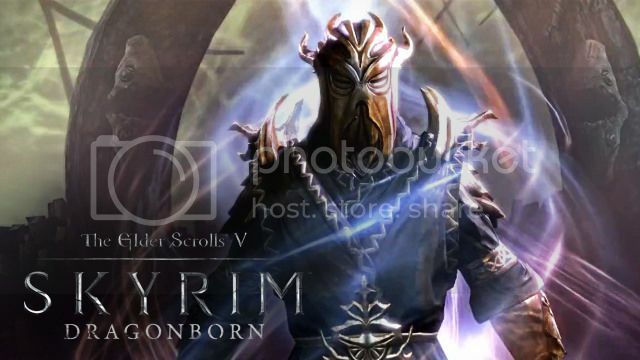 The trailer revealed to us that there is another Dragonborn, another being out there capable of absorbing dragon souls, one that has been around since the days of the dragon priests. It showed the player traveling to the island north of Skyrim and Morrowind, Solstheim, as well as the daedric realm believed to be of Hermaeus Mora. It also gave us a peek at several new pieces of armor and weapons and of new monsters to fight (some of them using spears), and even showed the character climbing on a dragon. The info released with the screen shots that followed offered a few more details, pointing out new shouts and spells, including Dragon Aspect (allowing you to summon inner power of the dragon to deliver colossal blows and strengthen other shouts), the ability to discover dark new powers in a new Daedric realm (again we assume Hermaeus Mora's) while collecting books of forbidden knowledge, and the ability to choose new paths for skills and abilities. It also told us what the code leak hinted at: new armors of Bonemold, Chitin and Stalhrim, and new locations of Solstheim, Raven Rock and Skaal. So apparently the dlc is as big as the actual vanilla game, and we get a whopping 278 new items and "A Ton of quests". As for spears sadly we don't get them apparently only rieklings use them and technically their arrows we can shoot with our bow. They also don't do allot of damage. 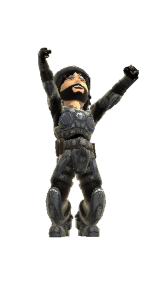 We also get "deathbran" armor which apparently is better then ebony. Along with stalhrim which as far as i know is for armor and weapons. Apparently the dlc is very hard as well, he said "you wont beat it on master" We'll see about that. And he also said he has boots that *dundundun* you can walk on water with! Im exited for that. Pretty much from the point of "the DLC is just as big as the vanilla game," they lost me, though I could see the deal with spears being possible, though it would break the hearts of many gamers waiting to get their hands on spears for the game. The size of Solstheim is about equal to the reach and it does have its own seperate map. The map above is from another 'leak' and is said to be similar, but that the markers shown on it are not accurate. Location actually discovered by player so far: Raven Rock, Tel Mithryn, Skaal Village, Fort Frostmoth, Ashfallow Citadel, Highpoint Tower, Hrodulf's House, Abandoned Lodge, Kolbjorn Barrow, Bloodskaal Barrow, Vaholok's Tomb, Gyldenhul Barrow, Dwemer Ruines of Nchardak, Kagrumez and Fahlbtharz, Saering's Watch Dragon Lair, Miraak's Temple, and plenty more. 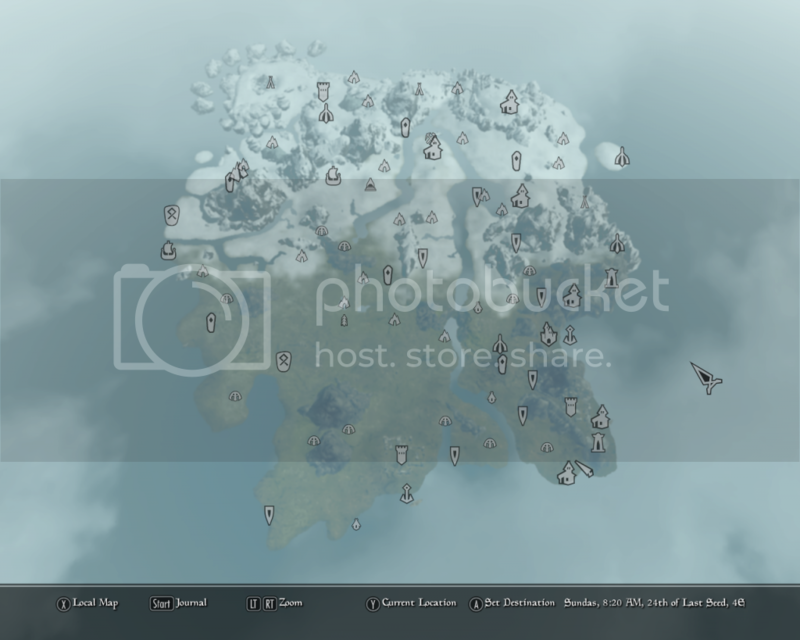 Plus 'Last Vigil' location added in Skyrim. There is a deathbrand armor that is similar to stolhrim and there are two unique scimitars the player can get by the end of the quest. The ability to walk on water is back in potion and enchantment form. Camps of werebears seen, though no word on whether player can become one. No word on dragon riding yet. The glowing dragon armor from the trailer is from the Dragon Aspect shout and can only be used once per day. 'The Oghma Infinium is just the beginning', leading into the fact that the Hermaeus Mora speculation is accurate. The Volcano pictured in the trailer is the Red Mountain and does spew ash constantly. A ring that allows resurrected creatures to explode into frost and fire damage when damaged. New conjuration spells for the new Ash creatures. A new conjuration spell that allows for the summoning of something cool that the poster doesn't want to spoil. 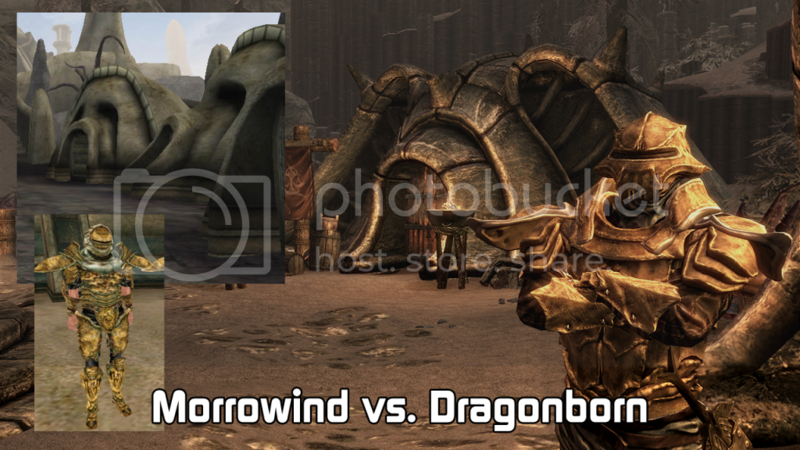 DLC starts by Cultists of Miraak searching for the 'false' dragonborn (you) and trying to kill you. You backtrack their path to find your way to Solstheim. Poster says they are 30 hours in so far and still not done, though also added you could probably rush through in 10 perhaps. Riding (they haven't gotten to this yet), Dragon Aspect (the glowing armor you see in the trailer) and Battle Fury (like elemental fury, but for NPCs). Again, we can't vouch for these rumors personally, so take it all with a grain of salt; but who doesn't love to discuss the possibility of what new toys and adventures are coming out that we get to play with? Either way, we'll all know how accurate they are next week.